America is both a place and an idea. The idea is one that was founded on indestructible principles. These virtues are the foundation of what has made this country great. Has America lost its values? What is considered virtuous these days? Is it what brand name your clothes are or how big your booty is or is it how big your employer is? What about the number of followers you have on social media? Does this prove you are good or virtuous? Michael Phelps is the greatest Olympic athlete of all time. There is no one in the history of the game that has stood on a podium to accept a medal 22 times. Only Mike P can say he’s done that. Michael Phelp’s amazing accomplishment could not have come without god given talent, his acknowledgement of his talent, and then insane dedication and hard work to take that talent to its maximum potential. Think about what it takes to remain focused for over 12 years of Olympic training and competition? This is what virtue is all about. What if Michael Phelps was more concerned with vanity than virtue? What if he cared more about how people thought he looked than what he wanted to accomplish? Have you heard the story of the teenage girl that didn’t like her huge ears so she got money from some pro-spoiled-brat charity to have her big ears “reduced”. Yeah the huffpo trendies were so proud of her too you should check out the comments on this article. 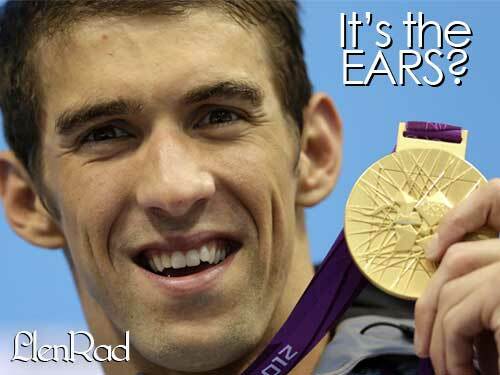 Her ears were no bigger than Michael Phelp’s. Now what will she do when something else on her body is picked on her peers? Go back to see the plastic surgery doctor? I”m sure he’ll be glad to take her money. What will the trendies say when she looks like Joan Rivers at her senior prom? They’ll probably say, you look fine, while everyone else laughs and makes even more jokes. What will she do then? Thanks Michael Phelps for proving that if you believe you can achieve. Even with big ears. ‹ Who kicked the crap out of Harry Reid?